Here is a glimpse of the stories of 4½ kids with leprosy, treated in Lalgadh Leprosy Hospital earlier in 2011, as told by Dr Graeme Clugston, who works at Lalgadh. (Sabari) has, and you can see she has had reconstructive surgery to transfer tendons on her leprosy semi-paralysed left foot and leg, which is now in a plaster cast – so little Ajay is looking after her for the couple of months while she is in hospital. The other four kids, are a girl and three boys, ranging from 10 -16 years old. Here they are they are thrilled at the idea of your reading their stories and seeing their pictures. too ill. He got leprosy a year ago when he was 13, and it started with some patches on his skin. After trying different skin remedies, his family guessed it might be leprosy and sent him to Lalgadh Hospital, and we started him on the 6-month course of treatment. Soudaga’s family has leprosy – his grandma and his uncle both had leprosy and know what it’s like, and his little brother (now 9 years old) has leprosy too and is now on treatment. Soudagar’s Dad is away from home, and his Mum earns enough for the family to survive working as a farm labourer, gathering rice mostly. Although Soudagar finished his 6-month course of leprosy treatment some months ago, he suddenly developed a Type-2 Leprosy Reaction three months ago – a rather horrible allergic reaction that can happen unpredictably at any time. And it can happen over and over again at any time for the next 20 years even long after leprosy treatment has been completed. It results in big painful lumps under the skin that erupt like boils, and it affects the whole body, also affecting various body organs. 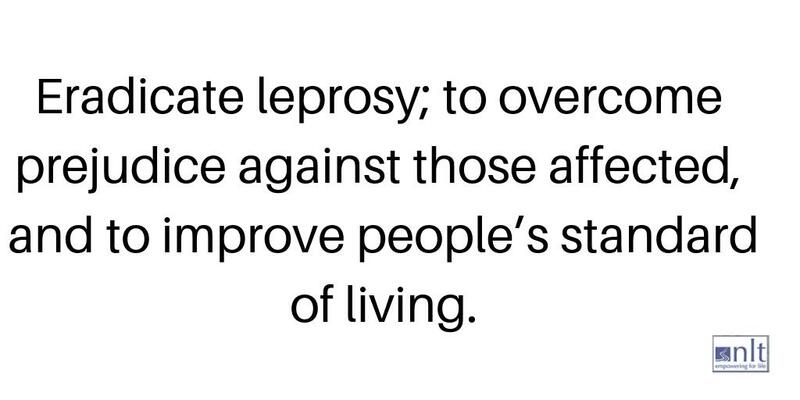 Sadly it’s quite a common part of the horrible range of what leprosy can do to a person, and we have had a number of deaths from this each year, even in kids. Although Soudagar seemed to be getting better a few days ago (when I took these photos) but today he has a high fever and the lumps on his arms, legs (bandaged), face and trunk are getting larger and more painful. His happy smile has gone today, and we are working very hard to try and stop this reaction. months and undergoing successful reconstructive surgery on his right hand. He is in third class at school, and he has two sisters and two brothers. His Mum says that even though she has had five children, she is only 25 herself … says she had her first when she was only 12… (but I think she is probably about thirty). Seikh caught leprosy two years ago when he was only eight years old, beginning with some pale patches on his skin, but he soon he began losing sensation in his right hand. It got to the point where he couldn’t hold a pen or write. He took leprosy treatment for the necessary six months, but even so the fingers on his right hand started curling over like a claw. That’s another of the awful sides of leprosy – once it has damaged nerves, whether in hands, feet, face, or eyes, the damage is mostly irreversible. So we admitted him as a patient 4 months ago, started him with physiotherapy to loosen his fingers, and them he underwent reconstructive surgery by our Dr Lama – where the tendons from some of Seikh’s properly-working fingers were split and transferred to the clawed paralysed fingers. This was very successful, and after a month, when the plaster-cast was removed from Seikh’s forearm and hand, his hand had healed nicely and he began physiotherapy to learn how to use his fingers again. His brain had to figure out how to move the previously clawed paralysed fingers, now that tendons from other fingers are attached. You can see the healed scar across his right hand. So Seikh and his mother are both thrilled because he can use what was a paralysed hand, and go to school, and can write again…. and today they are going home. Robana … is such a very shy little girl, and is just 10 years old, and has only been in hospital a few days now. She has a severe Type-2 Leprosy Reaction, and you can see the nodular lumps all over her arms and legs. We were worried about her because she has had leprosy for a year but only recently started leprosy treatment. One of the ways diagnose leprosy is to do a skin smear – a little smear of fluid taken from little nick in the skin of a person’s earlobes and any patches or nodules on arms or legs, and examine these under a microscope looking for leprosy bacilli. Robana’s skin smears were teaming with millions of leprosy bacilli – so she has the most severe form of leprosy. She is now on treatment at Lalgadh Hospital, and she is on high doses of steroids for her Type-2 Reaction. Robana comes from a village more than a day away by bus travel. Her family is Muslim, and she has 4 brothers and three sisters, four of them older than her. She doesn’t go to a Government school as her family, being Muslim, prefer to send her to an Urdu school. We are not sure yet whether she can read or write her name, but she will join in our children’s school that we run in the inpatient ward. She is very sweet, and too shy to talk to anyone yet. It took a while and some biscuits, but Meena managed to get her cheered up and a big smile. still a young child he went to India to work cutting weeds but came back to Nepal when he was 13. Then two years ago, when he was 14, he developed a skin patch and then an ulcer on his elbow. He started to feel tingling and pins and needles in his arms, and then sadly a weakness developed in his right foot. His family and village friends urged him to come to Lalgadh Hospital where leprosy was diagnosed. We noticed his right foot was weak and drooping – this is an early foot-drop due to leprosy-damage to his leg-nerves. 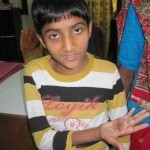 Dev Narayan’s father and mother have both had leprosy and were successfully treated before any complications set in. Then recently he has also developed a Type-2 Leprosy Reaction – painful lumps and bumps erupted on his arms and legs and face. So we are treating Dev Narayan’s Type-2 Reaction with high doses of steroids, and we worry about his foot drop – we’ve put his leg and foot in a splint to help him keep his foot elevated and the nerve rested, and he has daily physiotherapy….and school lessons to help him read and write and learn some maths and games. But if his foot drop doesn’t improve, he will need reconstructive surgery. Despite these difficulties he is a happy boy as you can see from his smile, and like Soudaga, he helps us in rolling bandages for other patients. So these are our four and a half kids with leprosy, recently in our inpatient wards at Lalgadh. Despite the struggle some of them are facing, ironically it is the cheerful bravery of children such as these (if they are not too ill) that add such a cheerful note to the wards at Lalgadh, and it certainly helps the other older patients – especially those who have been depressed due to their progressing leprosy disabilities, or their ulcers, or because they have suffered stigmatisation because of their leprosy. Do keep helping us to work together and make a real difference in practical ways, reaching out with healing and love and support to help children like these affected by leprosy.